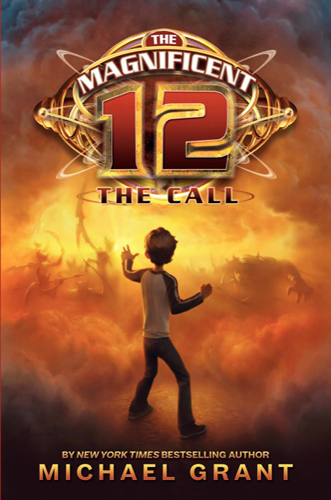 I have just finished reading The Magnificent 12: The Call, the first in a brand new fantasy series by Michael Grant. With twenty-one phobias and counting–including a fear of phobias–twelve-year-old David MacAvoy (Mack) seems an unlikely hero. But through the pipes in the boys’ bathroom, Mack receives word from a 3,000-year-old man that the Pale Queen is about to be destroy the earth. In his DNA, Mack carries high doses of the enlightened puissance needed to stop her. He must join up with eleven other chosen children to save the world. “So, David, how was school?” his father asked as he tonged chicken strips onto his plate. “Bunch of interesting stuff happened today,” Mack said. “And don’t just tell us it was the same old, same old,” his mother said. She passed ketchup to her husband. “Well, you’ve always done well in your language classes,” Mack’s mother said. On the downside, Grant’s writing is plain, with not too much concern for passive verbs or replacing “said” with more interesting words. His characters feel stand-offish–I never really connected with any of them. And I really didn’t buy the major scene in which Mack’s co-hero Jirrah fills him in on back history based on ancient records scratched onto a cave wall. Perhaps meant to be funny in it’s rapid-fire, extremely coincidental delivery, it simply comes off as author laziness. But Grant delivers bold, hard-hitting action. Buggy monsters, a beautiful shape-shifting enchantress, quirky elves, a magic language and a parallel story that takes place 3,000 year prior, kids are going to eat this up. Grant also has a fun, interactive website with an very well-done book trailer. I LOVE the character illustrations, both on the book and on the website. While The Call will never rate among my personal favorites, Grant offers an appealing, hilarious adventure to middle-readers. Approx ages: 9-13. No news yet on sequels. Wow! Erik, your blog is awesome! Thank you! I really like yours too. I suscribed to yours by email. You have some really good suggestions of books to read! Erik, would you consider submitting a guest review I could post on my blog? If you’d like to, paste your review (any book you choose) in an email and send to write@michelleisenhoff.com and I’ll publish it in my “reviews by kids” category with your first name, age and a link to your blog. I’d love to send some traffic your way! Consider it an open invitation for whenever you get around to it.